My room is at the furthest point possible from our router at home. Yes, it is at the three-dimensional opposite point if that makes any sense. Up until recently, that meant terrible terrible wifi. I spent quite a bit on trying to find a good solution, always browsing the latest wireless technologies, and contemplating purchasing one of those 100+ ft ethernet cables and sending a cord across the entire home. Of course, at college I don’t have any issues like this, so when I came home for winter break, I was determined to fix the problem. The solution I picked was one I hadn’t actually heard of before: powerline networking. 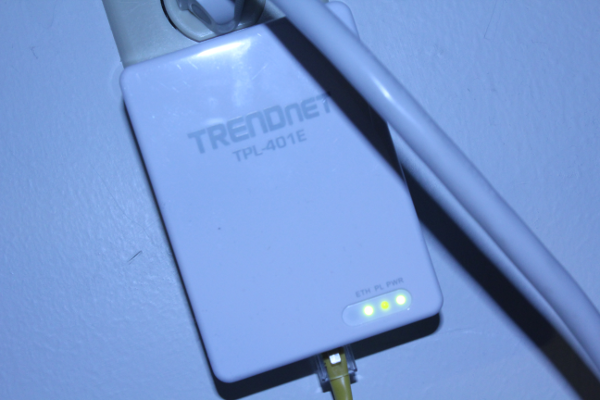 2 days ago, I went out and bought two of these “powerline adapters”, and so far, the system works marvelously. These powerline adapters are really easy to use. Installation is as simple as plugging in one adapter into the wall and a router or modem, and plugging in the other adapter into another wall and your computer. No additional wiring needed: it uses the wiring that already powers your house. I went with the 500 mbps model and am very impressed! A little warning though: there are a few competing standards for this technology and they are incompatible with each other, so be weary of the system that you use when purchasing additional modules.